If a laptop weighs nearly 10 pounds, can you comfortably hold it on your lap? Probably not, and that's why we call gaming monstrosities such as the Alienware M17x R4 "desktop replacements." Because, really, they're desktops that are only slightly easier to move than traditional towers. The M17x R4 is Dell's Ivy Bridge refresh of its popular Alienware M17x gaming system. This new M17x keeps the aesthetics of the old M17x, and packs a new processor and graphics card. Our review unit, which costs $1974 as configured, packs a third-generation Intel Core i7-3720QM processor—one of the most powerful mobile Ivy Bridge processors on the market. The system also has 8GB of RAM (upgradeable to 32GB), a Kepler-based Nvidia GeForce GTX 680M discrete graphics card, a 500GB hard drive, and a Blu-ray reader/DVD-RW combo drive. Connection-wise, you'll find built-in Wi-Fi and Bluetooth 4.0, as well as a 2.1-megapixel webcam. The M17x runs a 64-bit version of Windows 7 Home Premium. 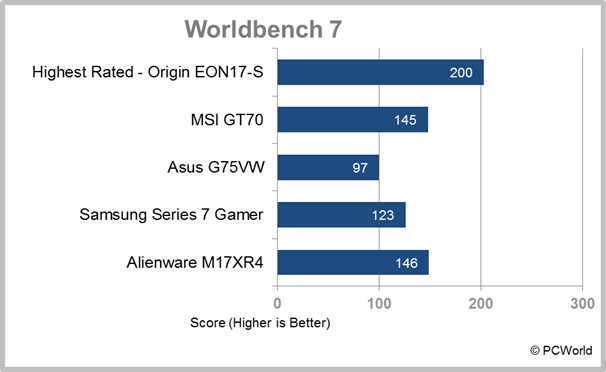 The Alienware M17x R4 scores a very acceptable 146 in PCWorld's WorldBench 7 benchmark tests. This means that the M17x R4 is 46 percent faster than our testing model, which sports a second-generation Intel i5-2500K desktop processor, 8GB of RAM, and an Nvidia GeForce GTX 560 Ti graphics card. It's a good score for the performance/gaming laptop category—about 20 points higher than the average score (121.7) of the last three performance laptops we've tested. That said, the M17x R4 still lags behind the category leader, the Origin EON17-S, which has a WorldBench 7 score of 200 and sports an Intel Extreme Edition i7-3920XM processor. Thanks to the new Kepler-based graphics card, graphics and gaming performance on the M17x R4 is very good. In our Crysis 2 graphics tests, the M17x hit frame rates of between 43.1 (maximum-level quality settings, 1920 by 1080 pixel resolution) and 96.1 (low quality settings, 800 by 600 resolution). 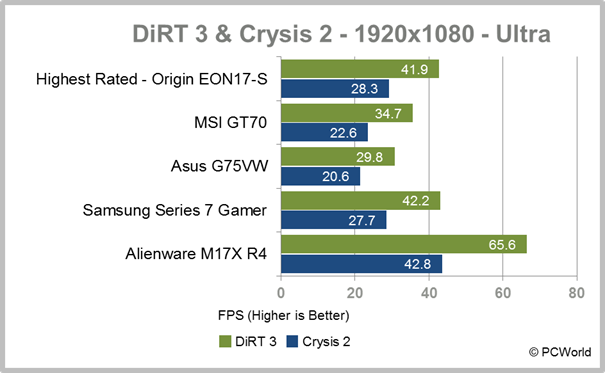 The M17x's performance in DiRT3 was equally impressive, posting 65.6 frames per second at 1920 x 1080, Ultra Quality. The mobile GeForce GTX 680M seems to offer a big performance boost over earlier generations of Nvidia high end mobile graphics chips. 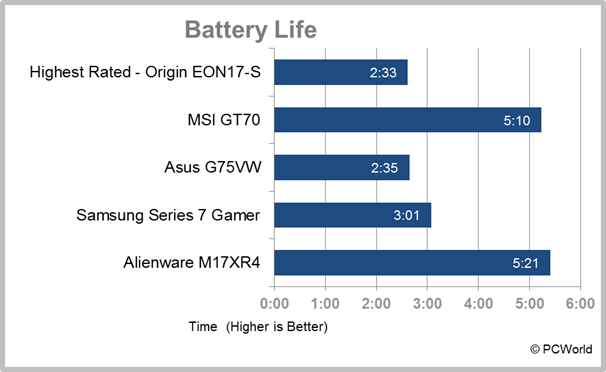 In our battery life tests, the M17x R4 chugged along for 5 hours, 21 minutes, which is the longest of any of our performance laptops. The average battery life of the last three performance laptops tested was just 3 hours, 35 minutes, and the EON17-S's battery life is even lower, at just 2 hours, 33 minutes. The Alienware M17x R4 looks exactly like its predecessor: one solid hunk of gaming machine. It weighs 9.39 pounds, not counting the two-pound power brick, which is heavy even for a performance laptop. The M17x R4 is housed in a solid black chassis covered in soft rubbery material. It's also covered in lights: The keyboard is backlit, with a sliver of light around the trackpad, the media keys are backlit, the alien head power button is backlit, the Alienware logo underneath the screen lights up, as does the alien head on the cover, and two medium-sized grills at the front of the computer also light up. The lights and the grills make this laptop stand out from other bulky gaming machines by adding a little cool factor. The laptop sports a full-size keyboard with regular-style keys and a 10-key number pad. The keyboard is laid out pretty typically, though the Page Up, Page Down, Home, and End keys are located above the number pad. The keyboard is comfortable to use, thanks to large, flat keys and good tactile feedback. Above the keyboard is a row of dedicated media playback buttons (volume up/down/mute, fast forward, rewind, play/pause, eject), as well as a Wi-Fi button and an AlienFX button. The AlienFX button takes you to the AlienFX Editor, which lets you switch up the keyboard lighting. Below the keyboard is a large trackpad with two discrete mouse buttons. The trackpad is smooth, comfortable to use, and accurate, though I still recommend using an external mouse for gaming purposes. The buttons are large, soft to the touch, and easy to press. Dell really outdoes itself with the M17x R4's port selection. It has pretty much everything you need: four USB3.0 ports, one eSATA/USB Sleep-n-Charge, VGA out, a mini-DisplayPort, ethernet, HDMI-out, HDMI-in, and a Kensington lock slot. Other connections: S/PDIF, microphone, headphone, and combo microphone/headphone jacks, plus a nine-in-one card reader. The M17x R4 sports a beautiful 17.3-inch glossy LED-backlit screen with a native resolution of 1920 by 1080 pixels. The screen is gorgeous: It has a glass-to-glass bezel-less design, it's bright, and colors look very good. Blacks are dark, whites are bright, and HD video plays without a hitch. Off-axis viewing angles are ample, though the screen does sometimes present a little too much glare. But there's a reason that Dell provides an HDMI-in port on this laptop—you really will want to plug other devices into this screen. Audio on the M17x R4 sounds very good. The speakers offer rich, full sound with plenty of bass and virtually none of the tinniness you usually hear on laptop speakers. The only real issue with the M17x R4's audio is the volume—the loudest setting is still disappointingly low, and barely loud enough to fill a small room. This particular refresh of the Alienware M17x R4 is…well, refreshing. The new Ivy Bridge processor and Kepler-based Nvidia graphics card offer up great performance, and the entire system costs under $2000—a pretty good deal for a gaming-oriented desktop replacement. The screen is gorgeous, the speakers are good (if soft), the keyboard is excellent, and the AlienFX lighting is a nice touch. Plus, it has excellent battery life. I can't think of a reason not to get the M17x R4, except for the fact that it weighs almost 10 pounds. If you're looking for a "portable" gaming powerhouse, you've found it. A huge, powerful desktop replacement at a surprisingly affordable price.